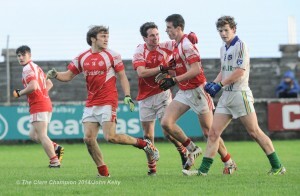 The Eire Og lads celebrate with club stalwart Tony Honan after beating Clann Lir in the U-21A final in Miltown Malbay. Photograph by John Kelly. 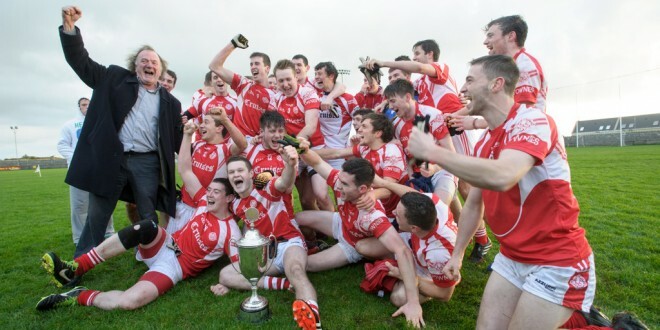 A strong final quarter helped title holders Eire Og retain the Clare under 21 A football championship title at Hennessy Park in Miltown on Saturday afternoon when they proved too strong for the North Clare amalgamation of Liscannor/Kilfenora/Ml. Cusacks. 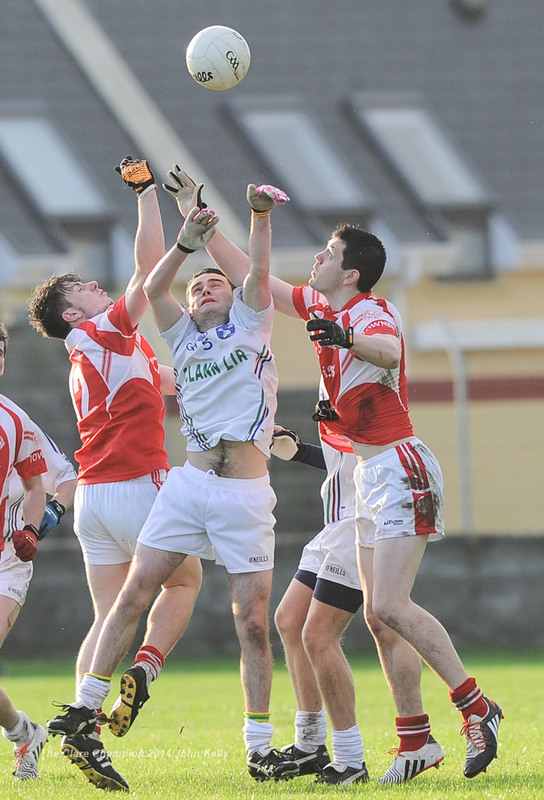 Liam Corry of Eire Og in action against Cian O Dea and Paul Carkill of Clann Lir during the U-21A final in Miltown Malbay. Photograph by John Kelly. The victory marked the Ennis club’s third in this championship and there is no denying the merit of their latest success. However, it took them a while to establish the upperhand and there were concerned faces in their camp at the half way point when they were just a point ahead after playing with the aid of the wind in the opening half. The amalgamation side showed one change to their starting line up to that which lined out in the semi-final a week earlier with Cian O’Dea ruled out due to suspension. 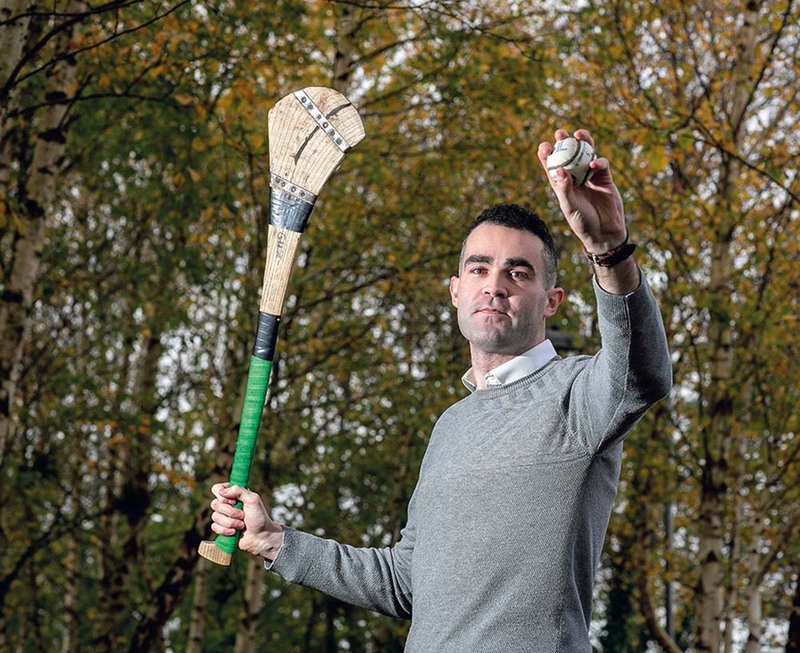 The Kilfenora teenager’s appearance before the Hearings committee of Clare GAA on the previous night failed. He was replaced by his Kilfenora clubmate Kevin Theasby. The North Clare side made the better start and led 0-3 to 0-0 after six minutes, two points coming from Micheal Duffy frees and the other from wing back David McNamara. Eimhin Courtney opened the winner’s account in the seventh minute and the champions hit the front four minutes later when Paddy O’Malley converted from the penalty spot after Cian Darcy was adjudged to have been fouled. 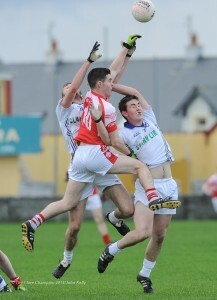 Shane O’Donnell and Liam Corry added points to open a one goal lead for the winners. Dara Walsh of Eire Og is congratulated for a goal against Clann Lir during the U-21A final in Miltown Malbay, by team mates Shane O Donnell and Paddy O Malley. Photograph by John Kelly. The amalgamation went back in front seven minutes from the half time whistle when Kevin Fawle blasted to the net after Micheal Duffy’s free had rebounded off the upright. Two points frees from Eimhin Courtney and Paddy O’Malley had the winners back in front, 1-5 to 1-4, when the half time whistle sounded. 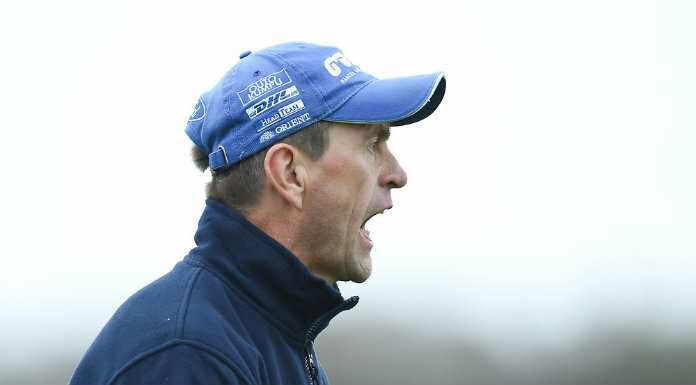 Eire Og showed greater determination on the resumption and two pointed frees by Paddy O’Malley had them three clear with just four minutes played. A minute later they lost centre back Aidan McGrath to a black card but with Liam Corry excelling in a defensive role, they grip on the game grew from here to the finish. 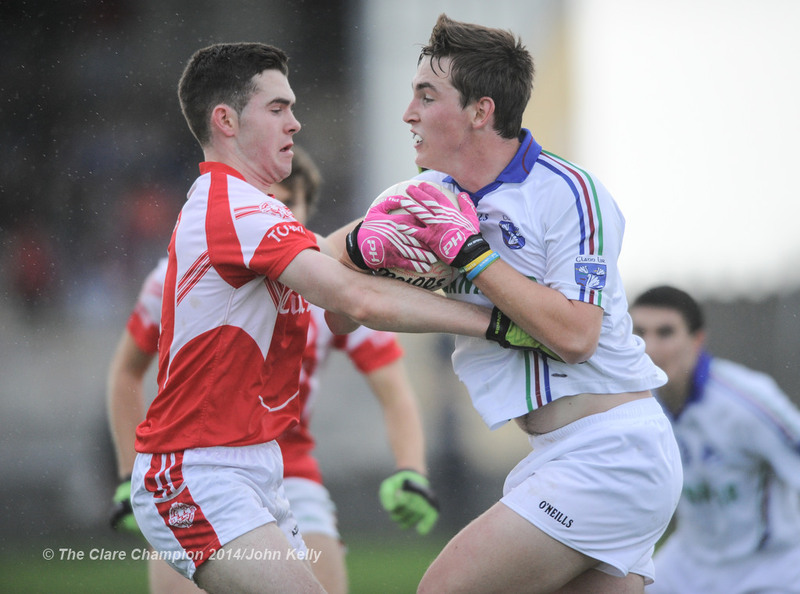 At the three quarter stage, the margin was still three, 1-9 to 1-6 but the final quarter belonged to the Ennis men. Goals from Eimhin Courtney and Dara Walsh put paid to the North Clare side’s hopes of causing a shock. The game ended on a disappointing note for the winners as their top scorer Paddy O’Malley was shown a straight red card in the final minute. O’Currys will contest the final of the under 21 B championship on Saturday next following their comfortable 4-17 to 1-8 win over Doonbeg on Saturday. 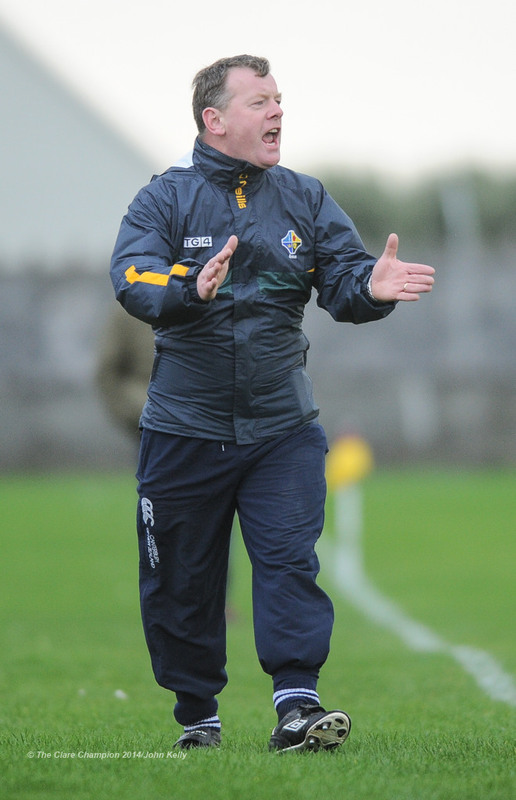 Donal O hAinifein of the Eire Og management on the sideline against Clann Lir during the U-21A final in Miltown Malbay. Photograph by John Kelly. Dara Walsh of Eire Og scores a goal against David Mc Namara and John Fawl of Clann Lir during the U-21A final in Miltown Malbay. Photograph by John Kelly. 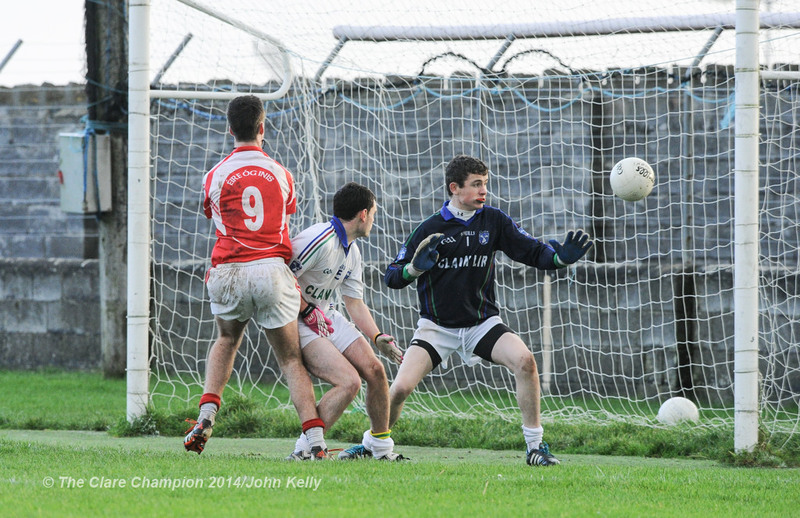 David Reidy of Eire Og in action against Jack O Dea of Clann Lir during the U-21A final in Miltown Malbay. Photograph by John Kelly. 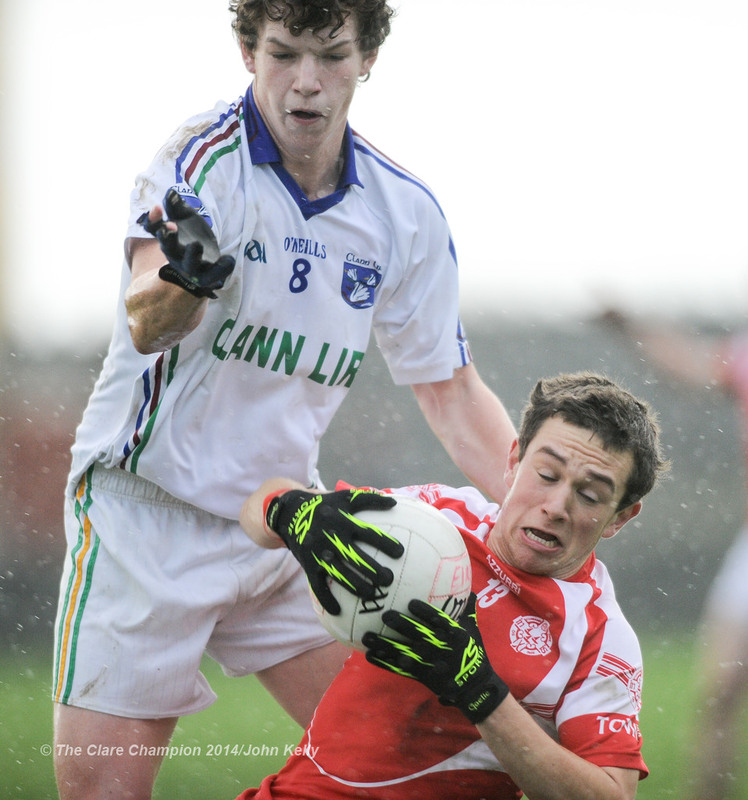 Liam Corry of Eire Og in action against Paul Carkill of Clann Lir during the U-21A final in Miltown Malbay. Photograph by John Kelly. David Mc Namara of Clann Lir in action against Conor O Halloran and Cian Darcy of Eire Og during the U-21A final in Miltown Malbay. Photograph by John Kelly. 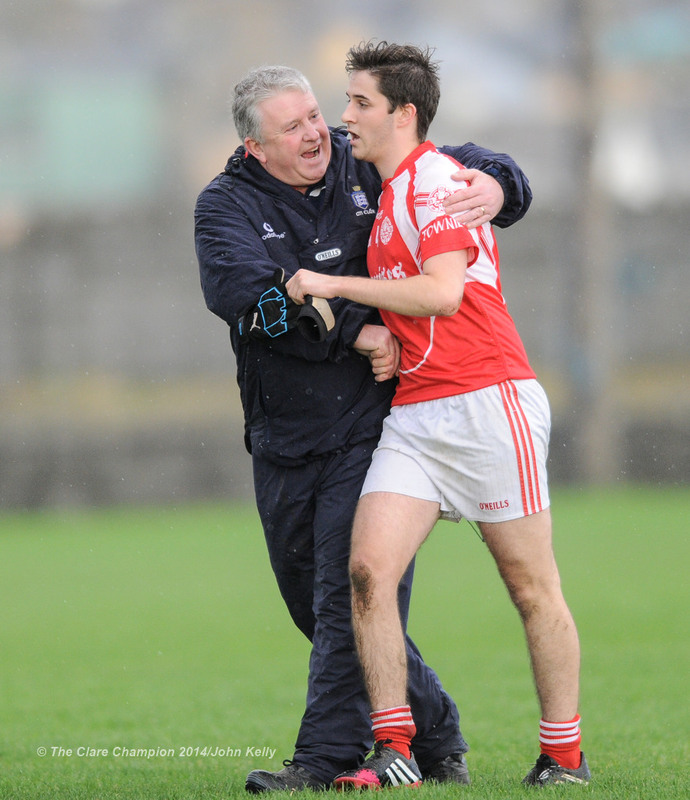 Dean D’Auria of Eire Og is congratulated by management Maurice Walsh as he is substituted late in the U-21A final in Miltown Malbay. Photograph by John Kelly. 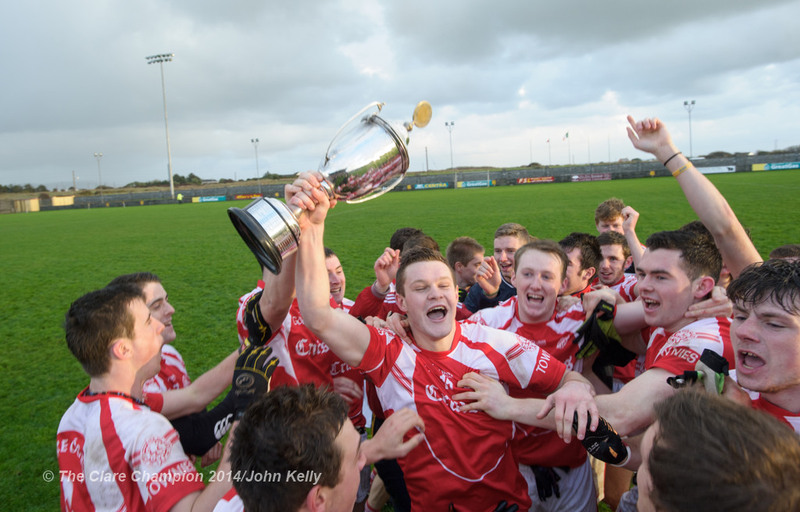 The Eire Og team captain Conor Brennan and his team mates celebrate with the John Marrinan Cup after beating Clann Lir in the U-21A final in Miltown Malbay. Photograph by John Kelly. 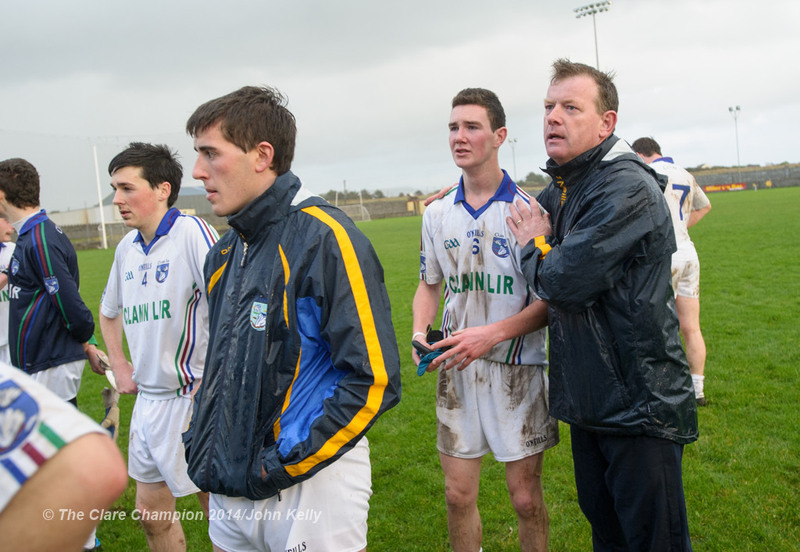 A clearly disappointed Darren Nagle of Clann Lir is comforted by Eire Og management member Donal O hAinifein following the U-21A final in Miltown Malbay. Photograph by John Kelly.